Albany, Oregon wants to join the ranks of cities with flags. Spurred by the vexillonaires of GUAVA (the Greater Unified Albany Vexillological Association), led by West Albany High School math teacher Cole Pouliot, the city is running a design contest through 5 pm Pacific Time on 5 July 2016. The design contest winner will receive a $100 prize. 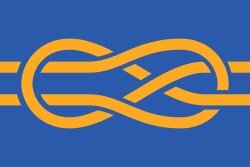 You can submit up to three entries by visiting cityofalbany.net/flag. What is Albany to you? Here are some facts to get started. Albany is the county seat of Linn County, and the 11th largest city in the State of Oregon. Albany is located in the Willamette Valley at the confluence of the Calapooia River and the Willamette River in both Linn and Benton counties. Albany is credited by historians and architects with having the most varied collection of historic buildings in Oregon. Albany, previously a primarily an agricultural and wood products manufacturing town, now calls itself the “rare metals capital of the world”, producing zirconium, hafnium and titanium. Albany and the surrounding communities are major exporters of grass seed. Albany’s easily accessible location along major roadways, railways, the Santiam-Albany Canal as well as the WIllamette and Calapooia Rivers cemented Albany’s original nickname of Oregon’s Hub City. The flag contest presents an opportunity for Albany to adopt for the first time a symbol of its unique character and history, as it currently has only the generic Americana of its city seal. For more on the contest and GUAVA, see the Albany Democrat-Herald article announcing the contest. Derek Duman and Cole Pouliot presenting the GUAVA flag at last month’s PFA meeting.